The immensely talented artist, musician, and all-around ridiculously handsome PETER HARPER. I feel bad about it, but somehow I had totally missed out on the fact that Peter produced an album and has been touring all over the place. 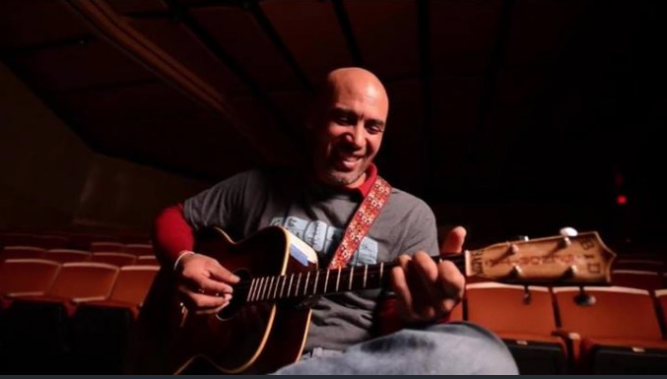 To rectify that, here’s an iTunes link to his album: https://itunes.apple.com/us/album/peter-harper/id73107349 If his last name is familiar, Peter is brother to musical talent, Ben Harper, but Peter totally holds his own musically. What a ridiculously talented family! If you watch the “Take it Home” video, you’ll discover a unique guitar…which Peter crafted himself. Like I said…ridiculously talented. For Chicagoans, Segregation Means Sox or CUBS? Which are you? As you may have gathered from my upper case CUBS, I’m the latter. You’ve never seen the purest and most breathtakingly vibrant green grass outside of Ireland until you’ve been inside of the “friendly confines” of Wrigley Field and cast your gaze upon that perfectly manicured, verdant ball field. I’ve actually been lucky enough to stand on Wrigley Field when THE POLICE did their reunion tour a few years back (and yes, THAT reunion tour was AMAZING). Chicagoans have an inherent bias towards one ball team or the other. For me, CUBS fans are always the “lace curtain Irish” of the North Side whom I tend to relate to the best, and the Sox fans? Well…no need to go into stereotypes. Living in the Midwest makes us hearty stock, and frankly, we have to be optimists in order to survive the harsh winters here. Spring is always around the corner, and we just know there’s a CUBS World Series win next season. 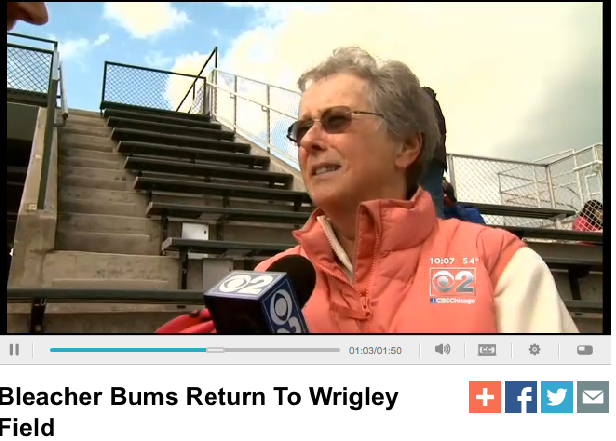 My Aunt Karen, on CBS Channel 2 Chicago News, enjoying her Mother’s Day present from her son-in-law Sean–a CUBS Game in the bleachers. 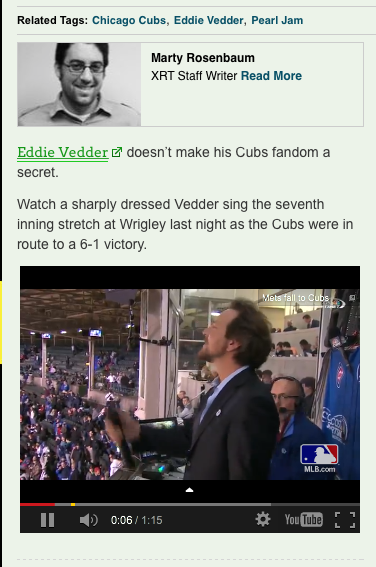 And then, as if the CUBS couldn’t be more perfect, Eddie Vedder sang the 7th Inning Stretch the other day at Wrigley Field. If I didn’t already love Eddie Vedder for the Pearl Jam song “EVEN FLOW,” which is right in my vocal range for karaoke and the most hauntingly understanding song about the homeless, my heart was ready to burst at the thought that he, too, along with Bill Murray (who merely needs to look at the camera funny to crack me up) were fellow CUBS fans. It’s a new season for the CUBS. A time for fresh optimism. Life. Is. Good. 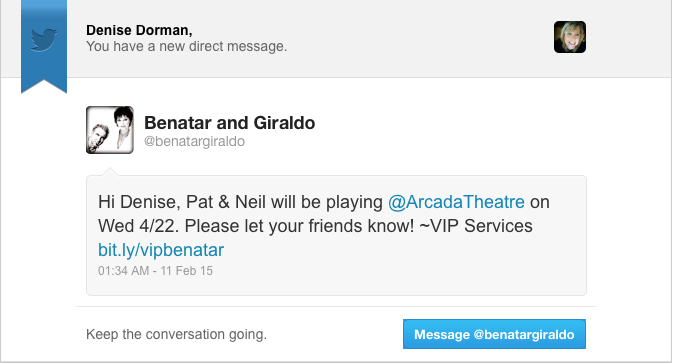 …and I couldn’t help but be reminded of the last Pat Benatar concert I attended. That was the fateful 1990s night that I and my crew got kicked out of the HOUSE of BLUES in Chicago. My partner in crime and BFF since 7th grade, Marovich, (see this link for reference) came to the concert with her daughter Shorty C-Spice’s 3rd Grade teacher, joining me and my friend Marlot Cheetah. (I should add, “Marlot Cheetah: The-‘t’-is-silent” is her bad 1960s Elvis Jungle Room name – mine is “Silkie Pantera.”) We four were in high spirits, ready to get our ’80s on. Marovich had some Club Level membership, which was really lame, because there was zero stage visibility from there. We decided to head down to the floor and party with the rest of the unwashed masses. I should add, Marovich’s little brother (who, by default, is my little brother, whether he likes it or not) had recently become employed as the lighting designer there. He was working that night, and his electronics boards were on the main floor level, out in the open, and rather exposed. This data comes into play a little later. I had one of my infamous big purses on my arm and a beer in my hand, carefully swaying to Pat Benatar’s impressive, operatic voice range. Out of nowhere, this couple in front of me turned around and threw a beer in my face. It was the strangest thing. I had no altercation with them, I wasn’t standing too close to them, and I had said and done nothing to provoke such aggressive behavior. I didn’t know Shorty C-Spice’s 3rd Grade teacher very well, but that night I learned one important detail: She has a hair-trigger temper. My plan was to ignore the whole thing and continue on with the concert. 3rd Grade Teacher’s plan was to start a brawl. 3rd Grade Teacher retaliated. She screamed some salty language while throwing her sticky cocktail at them. As I stood there swaying to “Hit Me With Your Best Shot,” ironically, the couple in front of me was chasing Shorty C-Spice’s 3rd Grade teacher into the front lobby. By the time I got there, the muscular, Italian boyfriend had 3rd Grade Teacher’s arms pinned above her head to the wall as his girlfriend was hitting 3rd Grade Teacher with her best shots, right in the stomach. It had escalated from zero to crazy town in a matter of seconds. Marlot Cheetah jumped right into the fray, and the muscular boyfriend threw her down. She hit her head, hard, on the metal railing. I can still hear the clanging sound. It was so horrible, frightening, and out of control. By the time the can’t-be-reasoned-with meathead security team arrived, we were all asked to leave. The beatings were clearly one-sided, and despite Marovich’s elite Club Level membership, nothing could be done. We were OUT. The next day our baby brother called, cursing us. He spent his morning cleaning his lighting electronics boards with Q-tips and rubbing alcohol. A sticky, mixed drink targeted for 3rd Grade Teacher somehow landed directly on his boards. He has since retaliated, and this triggered a never-ending practical joke war with “our” baby brother. There’s no end in sight. To this day, I still wonder what prompted this couple to throw their beer at me? It’s one of those unresolved conflicts to which I’ll never know the answer. I hate that it still rents space in my brain. …And our baby brother Johnny Rock Star weighs in.